Toco Toucans are found solely in South America. Their largest numbers are in Southern Brazil and down into Northern Argentina, but they can be seen as far north as the Amazon River Basin. Tocos are the only type of toucans that do not primarily live in the rainforest. They actually prefer semi-open areas with scattered trees. They can still be spotted in portions of the Amazon rainforest though, up to the mighty Amazon river. Like other toucans, they will build their nests in holes of hollow or rotted trees. Tocos typically grow to sizes of about 1.5 to 2 feet (.45 - .61m) in height. They weigh between 1 and 2 lbs (.45 - .91kg). Female tocos are smaller than the males. 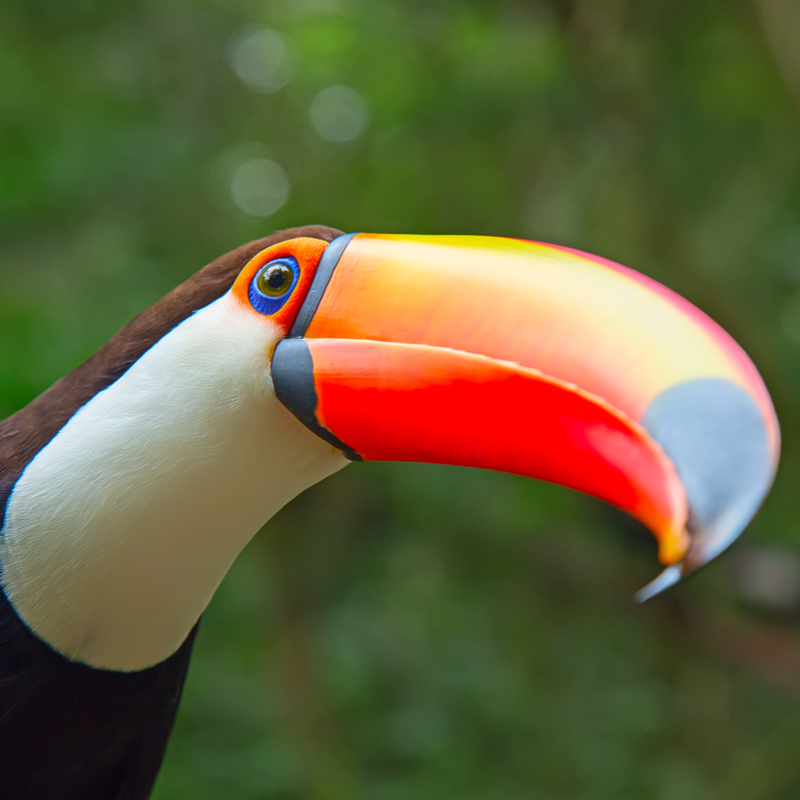 Tocos are probably the most recognizable member of the toucan family. Their most recognizable trait is their long, orange and yellow bill which usually grows to .5 - .75 ft (.15 - .23m) in length. They have a large dark spot on both sides of the bill near the tip of the bill. There are also light stripes that can be seen on the sides of the bill, if you look closely enough! Did you know? Toucan bills are mostly hollow! The outside is made of keratin, the same substance that makes up our fingernails and hair. The inside of the bills are a foamy honeycomb-like structure made of bony fiber and membrane. They have dark brown and black feathers on most of their bodies. Their front facial and neck areas, as well as part of their tail have white feathers. The rims of their eyes have a beautiful deep blue to almost purple shade. It truly is a magnificent bird! Like humans, tocos are omnivores, meaning they can eat vegetation and meat! Their favorite foods are small fruits, like oranges, which they use their bills and claws to tear apart. They will also eat small lizards, insects and eggs. Toco breeding periods depend on where they live in South America. The female toco lays about 2 - 4 eggs per clutch, and 1 clutch per year. After the female lays the eggs, both the female and male will share duties of incubating the eggs. Tocos have a number of predators, including snakes like the boa contrictor. They will also be hunted by medium and large cats of South America, and some predatory birds.